How about a book about man who can make characters out of books come to life, simply by reading aloud? 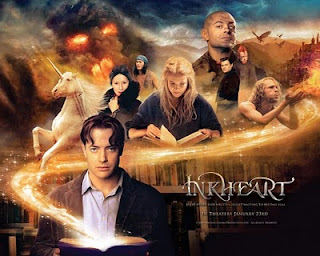 Last Friday we watched Inkheart. 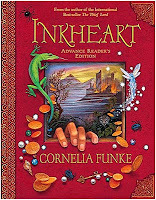 It was one of those hot summer days when the A/C of our local video store called us to blow off Netflix for a night, and so we did and there we found Inkheart --as if it had been calling to us. I am glad we just grabbed the movie without The Mom's usual researching for reviews and ratings before we view a movie, the movie reviews are 50/50 and we may have skipped it. (Click here to read a NY Times review.) We grabbed it because it sounded good! The Big Sister says, "its exciting and scary -but not over the top and I wish it never ended!" The Little Sister agrees, "it's great! It's wonderful its not too scary its just in the middle scary." The Dad "Inkheart was a movie for families even Dad's will love and actually stay awake through the whole thing." We highly suggest checking out the trailer --there are some scary parts: sinister mean guys from the Inkheart book come to life, a shadowy creature that while scary isn't over the top. The movie did its job it made us want MORE, later we hope to hit the library and pick up our reserved copy of Inkheart by Cornelia Funke which, thankfully, is a trilogy (click here to find a copy on www.worldcat.org.) We are excited to get start on the book, all Four of Us. We'll be sure to tell you whether the book is better than the movie! Do you have a movie suggestion? Click here and tell us! P.S. The Mom's two cents: "Just to see Helen Mirren riding a motorbike sporting goggles is enough to make this movie worthwhile and the three girls in the family all think Brendan Fraser has a lovely likeness to The Dad!"